The lively and appreciative crowd who came for the opening of Amy Cannestra‘s “Horizon” Friday evening was intrigued by art that demands a closer look. Entering the gallery on the far wall is a line of objects—upon closer inspection, conch shell shards. The shiny metallic bases appear to be aligned so that there is a clear line stretching across; a horizon. Another wall displays small abstract works on paper. Again, if you step back and survey the whole, a horizon. In her short speech to the audience, Amy gave insight into her choice for the work. First time visitor to Grenada, she was intrigued by the white objects while looking down in the shallow waters at the beach. She thought they were rocks. She started collecting them, only later learning that they were the remains of conch shells. She then wrapped the bases with the discarded copper coloured wrappers from the Grenada Chocolate Company confectionaries. The remains of the dead were adorned with the luxuries of the living. An additional feature of the work was a video that was projected on top of the shells, showing the waves crashing on the shore creating yet another horizon. In the gathering that evening was Grenada’s premier historian, Michael Jessamy. He generously shared the importance of the conch shells to the indigenous people of Grenada, the Kalinagos. The conch provided tools for everyday life—an adz, a knife, a digging tool. He also spoke about the large sharpening stones made of volcanic basalt that are still evident in several places in Grenada. He noted some of the shards that Amy had collected could have possibly been used over 2000 years ago as a tool for daily living. “Amy has given new life and attention with art to an object that was dead and unknown”, Jessamy said. The colorful line of abstract works on paper are reminiscent of island landscapes. Using a layered technique, the colors shift as you walk by, creating an ever-changing view of mountains, horizons, and reflections. The two sets of work in different mediums spoke to our collective memory. Objects discarded, that once had been part of daily life, crying out from the shore for human interaction. Mountains and valleys, so taken for granted, lining up in a beauty queen queue to vie for attention, to perhaps be the chosen one. There can be no doubt that this work was created in a particular place, at a particular time. It is a snapshot, a Facebook post, an instagram pic, of a very specific face of Caribbean identity. The exhibition will be up only for a short time. You need to visit this week, for on Friday the 23rd March it will come down forever. Hours are 10 am to 5 pm. 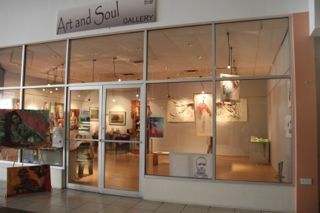 Susan Mains Gallery is at Spiceland Mall, in Grand Anse. Entrance is free.